The best crock pots and slow cookers available to purchase range from basic, no-frills Crock Pot models, to upscale, multi-feature slow cookers. This post will help you decide what make and model of slow cooker is the best one for you to buy. As a blogger who shares recipes, you might imagine that my kitchen tools get quite a workout. When I get a new appliance, or even something as small as a knife, I want to make sure that what I'm buying is the best. One question I am often asked is, “What are the best crock pots or slow cookers to buy?” Well, there are a few things to consider. You can get them in many sizes, from a mini 1 1/2 quart slow cooker to a 6-quart slow cooker . How do you know which will be the best crock pots to get? I own both of these sizes! 1 1/2 – 2-quart slow cookers – – these are great for dips, appetizers and making things like my slow cooker lotion bars. Most don't have a removable insert. 3-4 quart slow cookers are the best crock pots for making meals for 2 or 3 people. Large roasts won't fit in them, so have your butcher cut your meat down to size if necessary. You will not have many leftovers with this size. 5-6 quart slow cookers are the best crock pots to serve 4 to 6 people, and are the most commonly bought size. They will fit just about anything you want to make, and an oval size will allow you to bake things like a loaf of bread. In the past, I have owned Crock-Pot brand and Hamilton Beach slow cookers. My last crock pot had a ceramic insert that ended up cracking. While I was able to put the removable crocks in my dishwasher, I found it hard to get stuck on foods like cheese off without some elbow grease. When I went to buy a new slow cooker, I asked my Facebook fans and friends which ones they liked. After a ton of research, I decided on the Ninja Cooking System . You might be asking, “Aren't all crock pots the same?” Well, the simple answer is no, and here is why I chose this brand of slow cooker. Versatility – The Ninja Cooking system not only slow cooks but it roasts, bakes, steams and works as a stove top. Easy Clean Up – Ninja is the only brand that makes a slow cooker you can brown the meat in. This means fewer pans I have to clean up if I need to brown the meat first. Cleaning up is easier because of the non-stick coating. You can also use slow cooker liners and it will be a non-issue. Even Cooking – Other slow cookers over-cook meat, or cook it unevenly. This is because most other slow cookers only have the heating element at the bottom. Ninja has something they call Triple Fusion Heat™ technology, combining contact heat from the bottom and direct heat from the sides, making for evenly cooked meat. A Warm Setting that Does Not Burn Your Food – Many slow cookers have a feature to keep your food warm after it's finished cooking. This is handy if you set your crock pot before work and don't return for 6-8 hours. My previous slow cooker over cooked my food, burning or drying it out when it was being kept warm. Quicker Cooking – My Ninja cooks 30% faster than a normal slow cooker. Why is this handy? Well, when it's 1:00 and you realize you forgot to turn it on, it's no problem! Almost! Truthfully, nothing is perfect. Here are the things that I think can be improved. Why do I tell you this? Something on this list may be a game changer for you, and I want you to be happy no matter what slow cooker you get. Solid Lid – A big no-no when using slow cookers is to lift the lid, and quite frankly I like to see all that's going on. The Ninja lid is solid metal, like the insert, so there is no gazing on your cooking. They now offer a glass lid for $12.95 as an accessory, if this drives you too crazy. The length of the power cord – The power cord is short, only about 2 feet. If you have deep counter tops or not a lot of outlets you may need an extension cord. The ultimate would be if it retracted, hey a girl can dream can't she? The depth of the insert – The Ninja is wider and shallower, by about an inch than some other slow cookers on the market. If you have a big chuck roast, you may have to cut it into pieces to get the lid on fully. Not a big deal if you are making something like my taco and tostada meat but if you are making the perfect pot roast for guests it may be an issue for you. Hot Insert – Because it's metal, the insert is hot to the touch. Be careful, and always use pot holders to remove it. Not a big deal to me, but it might be to you. Now that you have decided on a slow cooker to buy, you might want ideas for what to cook in it. 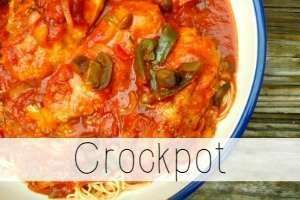 You can get all my best crock pot recipes by visiting my Crock Pot Recipes Page. Join our Facebook Group Tasty Slow Cooker Recipes or follow my Crockpot Recipes Board on Pinterest. Last but not least, you can order a cookbook or two. Here are some of my favorites!